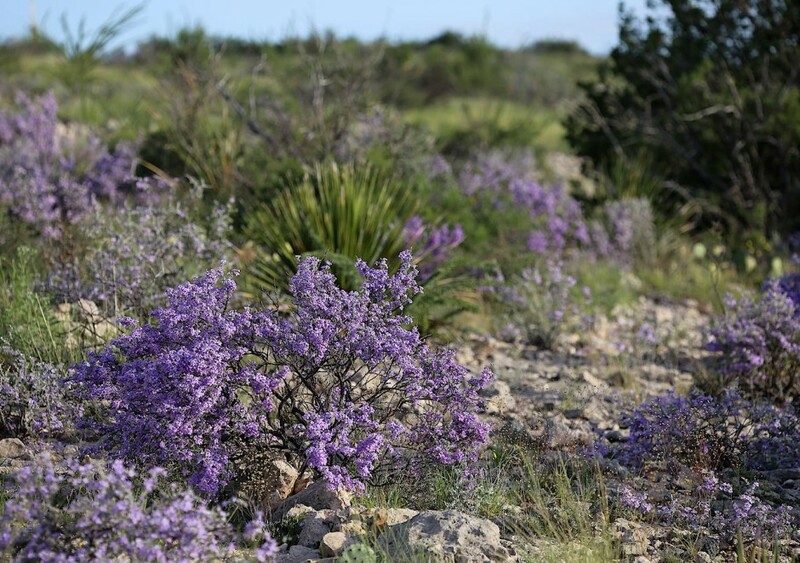 The Chihuahuan Desert is a massive arid region that straddles much of northern Mexico and a number of American states, including a large part of southwest Texas. 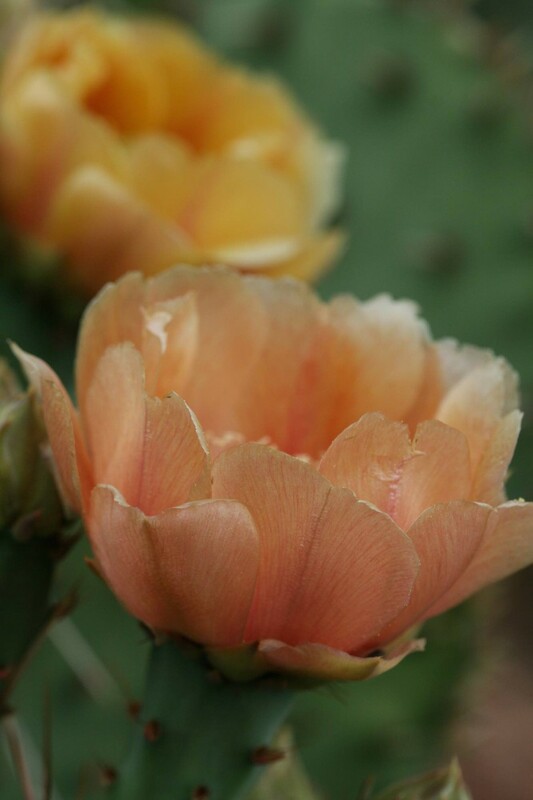 It’s among the most diverse desert environments on the planet. 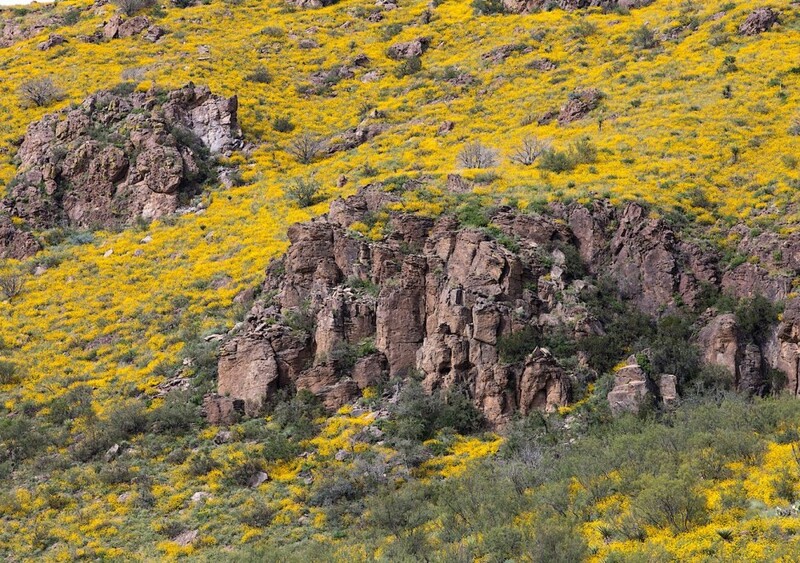 MatadorU student, photographer, and executive director of Chihuahuan Desert Research Institute, Cathryn Hoyt has been living there and documenting the region for a number of years. Check out these beautiful images of a very unique part of our world. 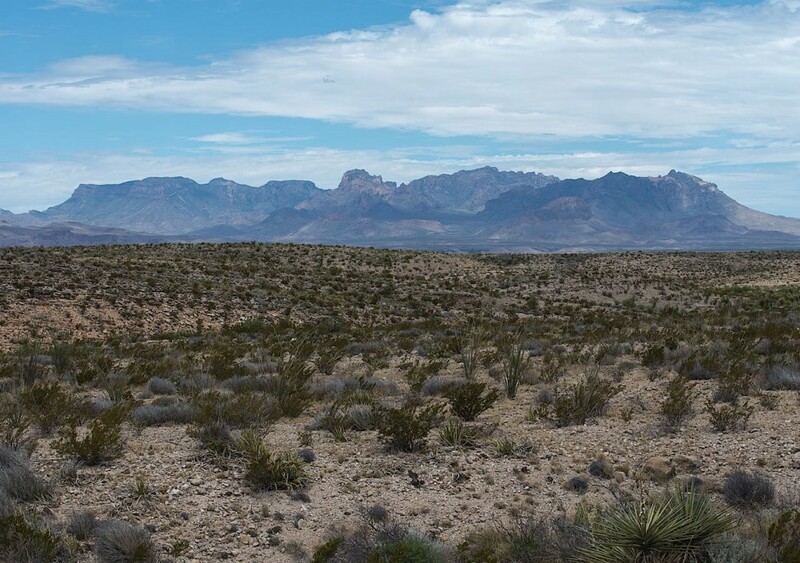 The Chihuahuan Desert is the largest North American desert and one of the most biologically diverse arid regions in the world. 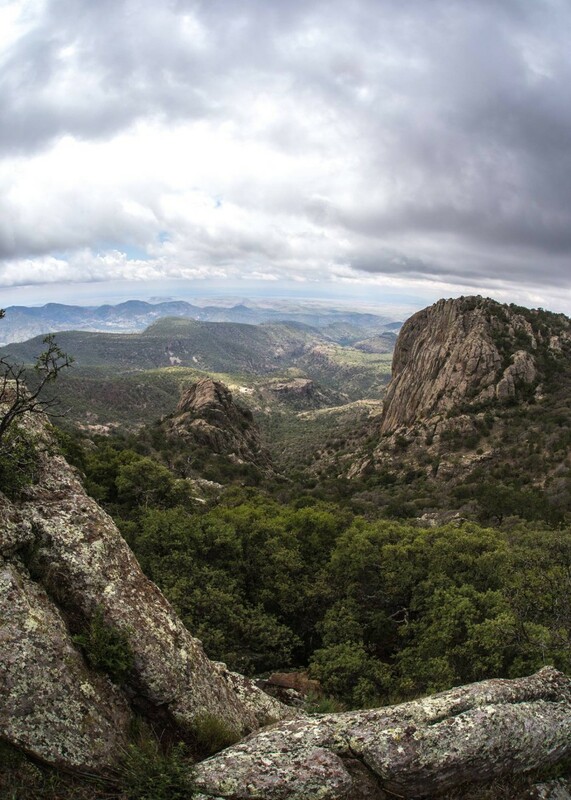 One of my favorite places to hike, the Chisos Mountains in Big Bend National Park, rise abruptly from the desert floor providing shelter for plants and animals that need a cooler, wetter environment. 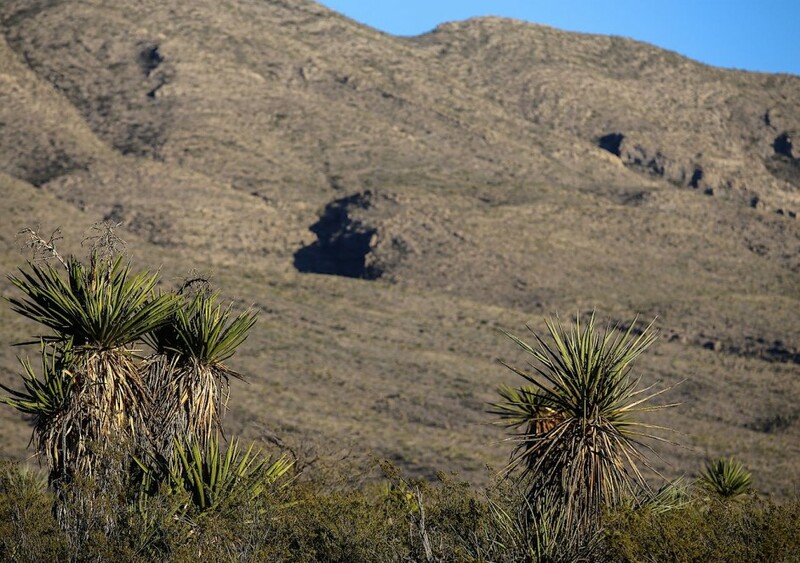 Hundreds of years old, stands of Torrey yucca are the “old growth forest” of the northern Chihuahuan Desert shrub land. 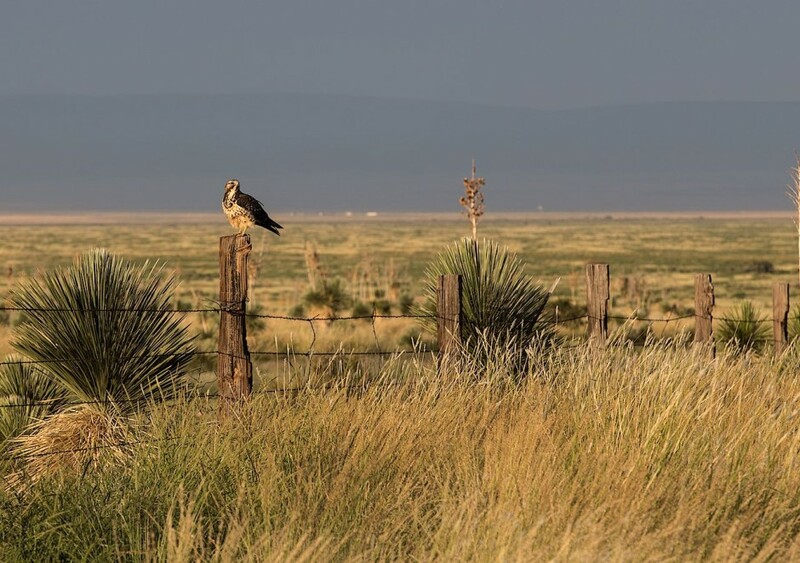 In the fall, desert grasslands attract large flocks of migrating Swainson’s hawks. Vehicles come to a screeching halt to watch the hawks perch on fence posts and strut through the tall grass hunting grasshoppers. The story of the desert is the story of water. 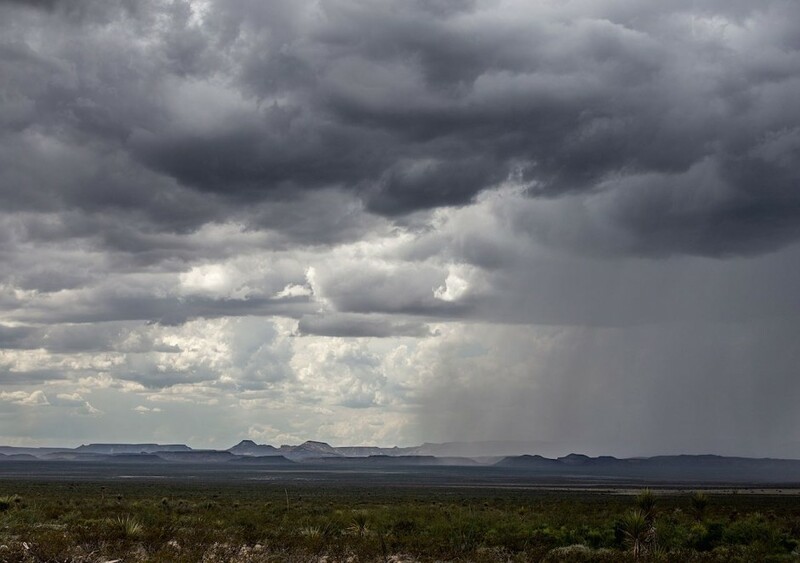 In the Chihuahuan Desert, over 75% of the year’s precipitation comes as brief, intense, and highly localized summer showers. A thunderstorm gathers over the Davis Mountains. Most of the rains fall in June or October, or through the summertime. The average annual amount is less than 10 inches. The Chihuahuan Desert is threaded with drainages; most of them dry. 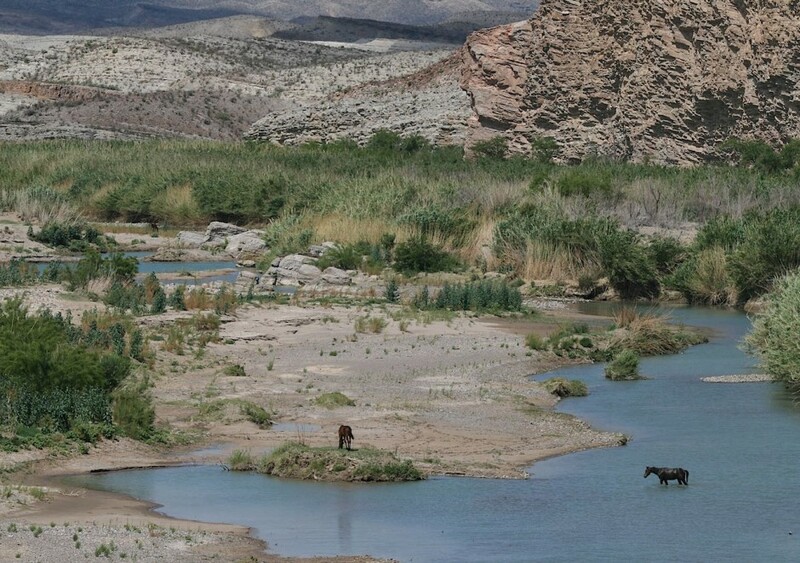 The Rio Grande is one of the few to carry water year-round—a much needed resource with such scant rainfall—but the river is threatened by increasing water use, upstream dams, and drought. After a rainstorm passes through, I search tiny potholes of water, called tinajas, for signs of breeding fairy shrimp, frogs, and dragonflies. All must reproduce quickly before the water evaporates in the intense summer heat. 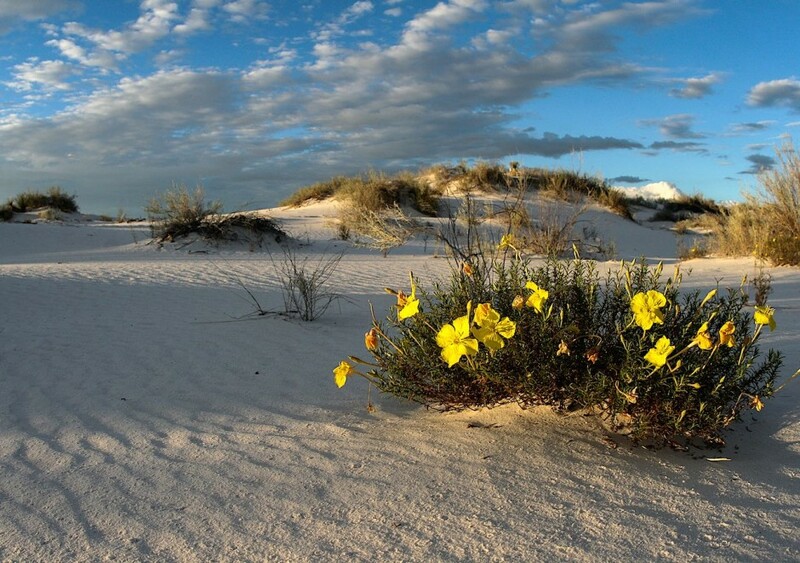 Evening primroses greet the cooler temperatures of dusk at White Sands National Monument. The monument protects the unique plants and animals of the world’s largest expanse of gypsum sand dunes. When not in bloom, cenizo is an inconspicuous little grey-leaved shrub. But give it some water and the world takes notice. Abundant rain in September results in a rare display of fall color as thousands of sunflowers turn the Davis Mountains gold in early October. 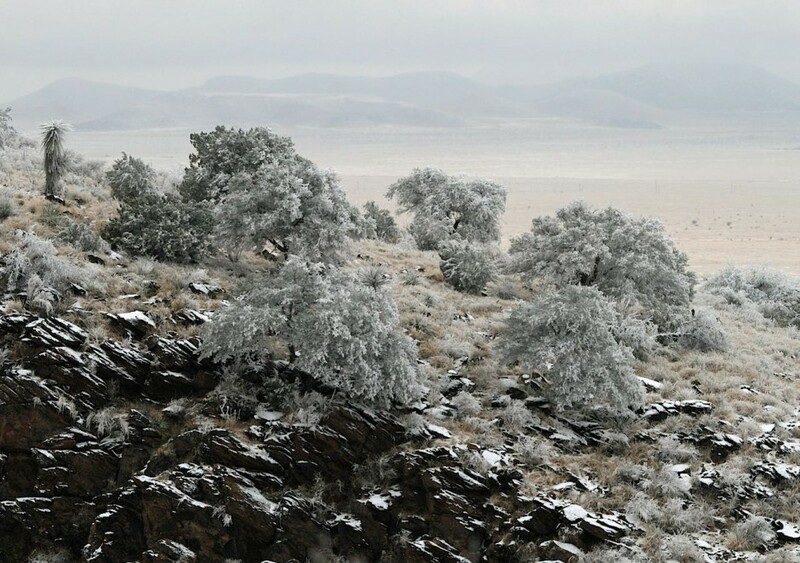 Although winters are typically dry, a Christmas Eve snowstorm blankets Fort Davis with a light dusting of snow. 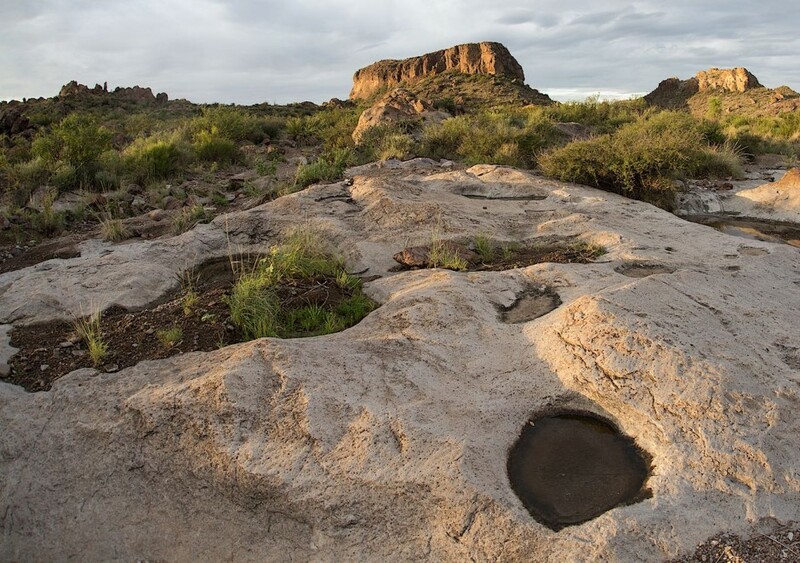 Historically, the northern Chihuahuan Desert was dotted with freshwater springs and desert wetlands known as cienegas. Today, these springs are rare, but those that still exist serve as critical habitat for fish, turtles, water snakes, and other aquatic species. 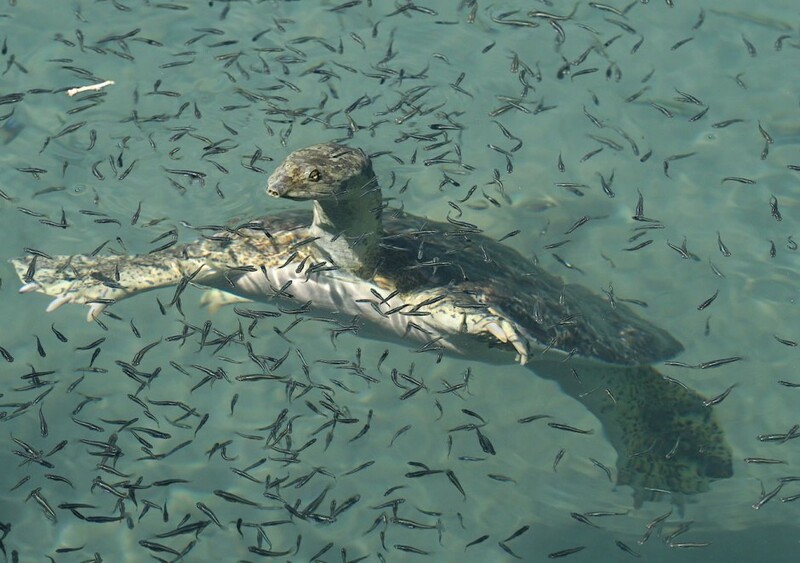 Here, a Texas spiny softshell turtle swims among two species of federally endangered desert fishes in the clear waters of San Solomon Springs. 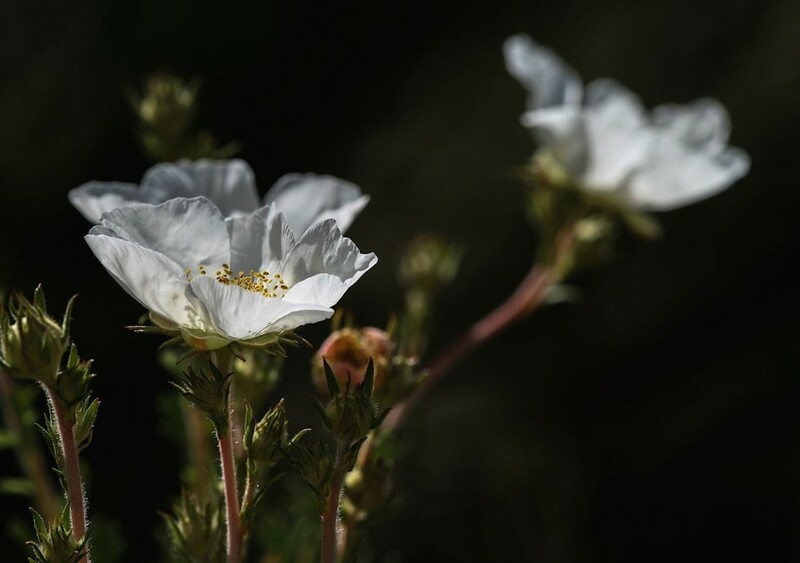 Hiking up a canyon in the Guadalupe Mountains, I was stopped dead in my tracks by the sight of this Apache plume, it’s white flowers backlit by the early morning light. A Mojave rattlesnake, using its tongue to sense my presence, soaks up heat from the road during the late afternoon. 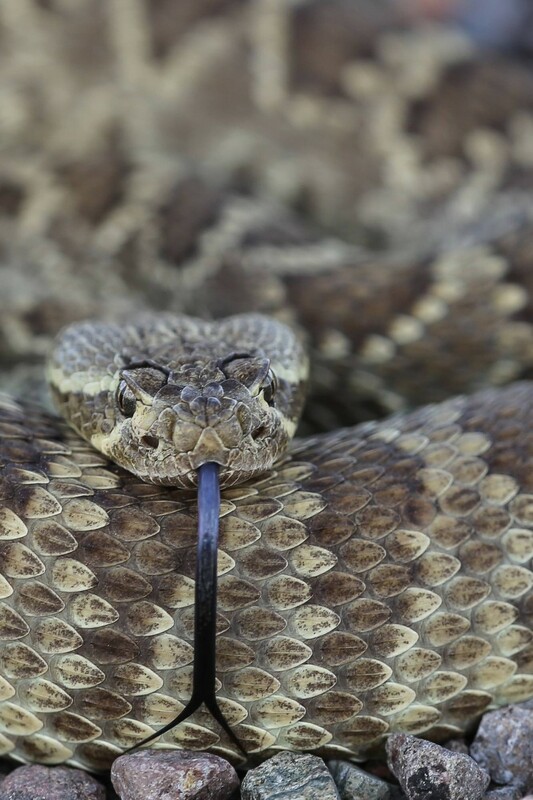 The Mojave is the deadliest of the four species of rattlesnake occurring in the Davis Mountains. 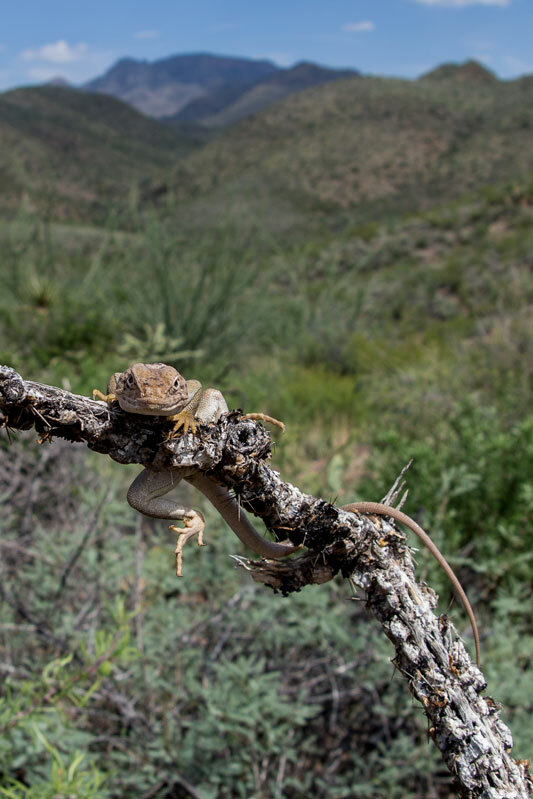 An eastern collared lizard hangs tight to the stem of a dead cane cholla cactus. Vulnerable, the lizard remained perfectly still, pretending to not exist, until I briefly looked away. In a flash, it was gone. 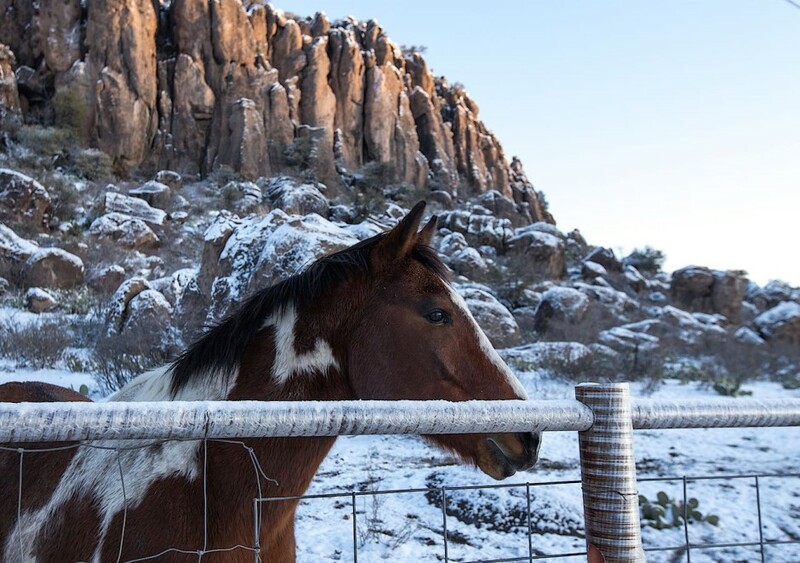 Horses remain an efficient way to work cattle on the ranches that surround the small town of Fort Davis. 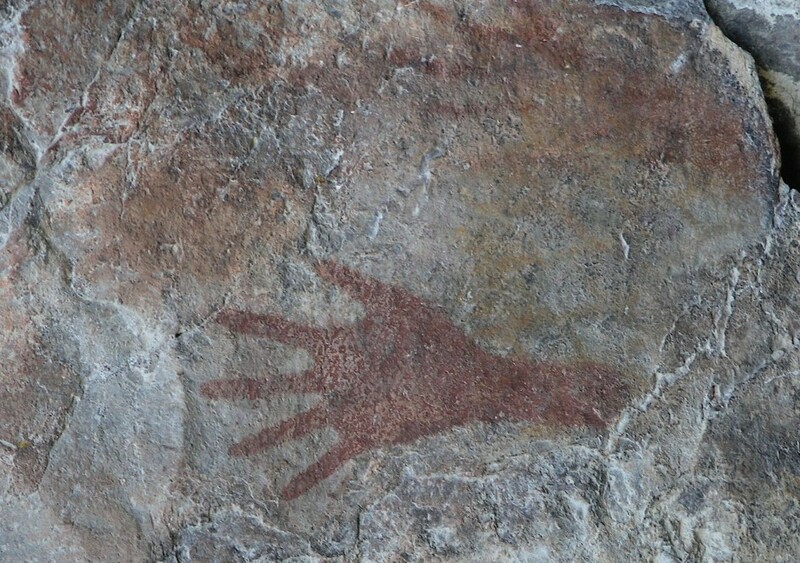 Ancient hand prints on the walls of Cueva Larga, Big Bend Ranch State Park, attest to the long human history in the Chihuahuan Desert region. Colored minerals, ground fine and mixed with animal fat, were used to create a long-lasting paint. 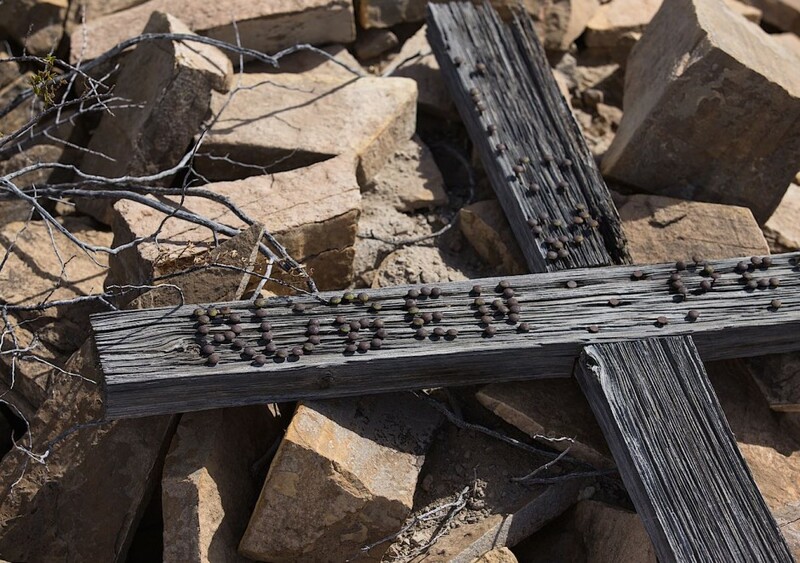 An old, wooden cross lies across a stone-covered grave in the Pilares Cemetery. Not much remains of Pilares today, but the area once supported an 18th century Spanish presidio - a military settlement - as well as a penal colony, silver ore smelter, and hundreds of acres of cotton farms. 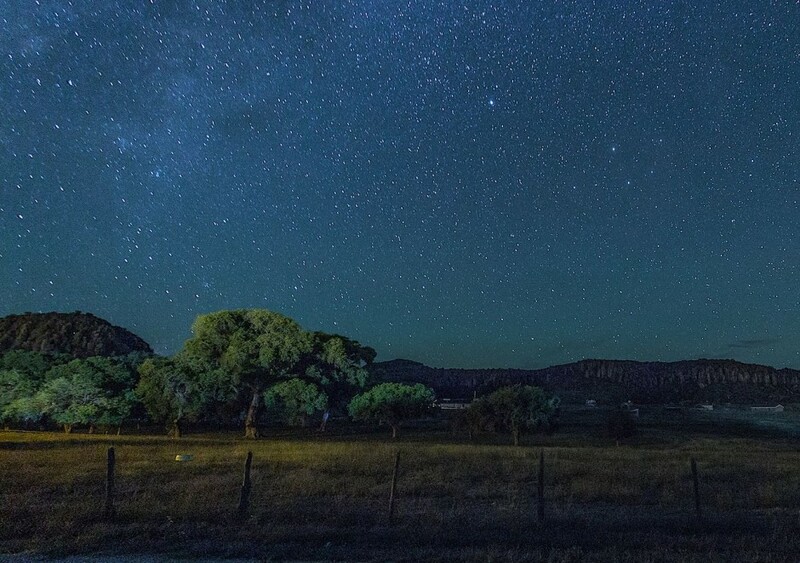 Thousands of stars scattered across velvet blue skies serve as the backdrop to the remains of old Fort Davis. Astronomers from around the world are drawn to the extremely dark skies and unpolluted skies of the Chihuahuan Desert.